Do you fancy a work-out while waiting for your flight? Increasing numbers of airline passengers do, as witness special facilities that have been installed over the years at some Far East and Middle East airports. Now it’s also an option at Baltimore Washington International, where the only gym at a US airport past security has opened, with plans for 20 more at airports by 2020. 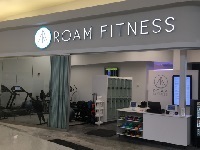 The ROAM Fitness gym at BWI includes an attendant who monitors guests’ flights and will alert them if there’s a delay. There is free luggage storage, options for renting workout clothes and shoes, and showers. Fees range from $40 a day to $175 a month. The concept was initially envisioned for international travellers and others with long layovers, but research revealed many others also wanted to squeeze in a workout before or after landing. Also on the health kick, San Francisco airport’s yoga room was so successful a second one opened in 2014. Dallas-Fort Worth International has a yoga studio with free mats, a walking path and two 55ft staircases for cardio exercise. And Minneapolis-St Paul International has a 1.4mi walking path. BTN still has reservations (if that is the right word). With certain major hubs in Europe and the Middle East one has to walk miles (or is it metres?) to make a connection.